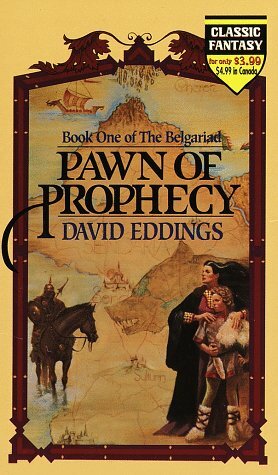 "Eddings' BELGARIAD is exactly the kind of fantasy I like. It has magic, adventure, humor, mystery, and a certain delightful human insight." Piers Anthony Long ago, the Storyteller claimed, in this first book of THE BELGARIAD, the evil god Torak drove men and Gods to war. But Belgarath the Sorcerer led men to reclaim the Orb that protected men of the West. So long as it lay at Riva, the prophecy went, men would be safe. But Garion did not believe in such stories. Brought up on a quiet farm by his Aunt Pol, how could he know that the Apostate planned to wake dread Torak, or that he would be led on a quest of unparalleled magic and danger by those he loved--but did not know...? Reed College in Portland in 1954 and a M.A. in Middle English from the University of Washington in 1961. After serving in the U.S. Army for two years, he worked as a grocery clerk, as a sales clerk for the Boeing Company, and as an English teacher in a business college and a teachers' college. During his lifetime, he wrote more than 25 books, many of them with his wife Leigh Eddings. His first novel, High Hunt, was published in 1973. His other works include the Belgariad series, the Mallorean series, the Elenium series, and the Dreamers series. He died on June 2, 2009 at the age of 77.